Sample Size Capacity Range from 25 grams to 1,000,000 lbs. An axial pull when exerted upon the material in accordance with agreed upon standards, and the results measured with scientifically accurate methods. 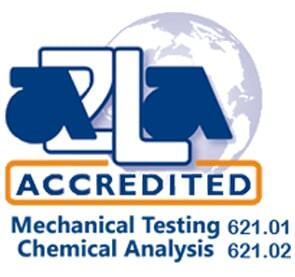 Tensile Testing is one of the most widely used mechanical tests completed on materials. By measuring the force required to elongate a specimen to breaking point, material properties can be determined that will allow design engineers to predict how materials and products will behave in their intended applications. The quality of materials used in manufacturing play a crucial role in the development of products. The Tensile Testing lab at WMT&R has helped thousands of companies from around the world determine the behavior of a material with their Tensile Testing capabilities. Why Perform a Tensile Test? 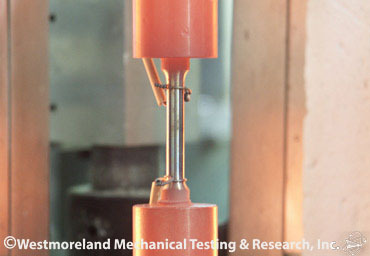 Many properties of a material may be determined by use of tensile testing. 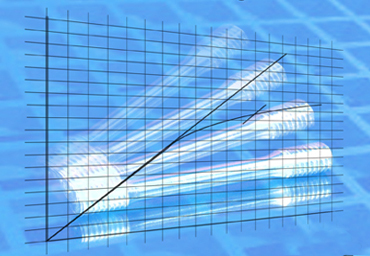 Tensile testing provides data on strength and ductility of metals under uniaxial tensile forces. The tensile strength of a metal is essentiality its ability to withstand tensile loads without failure. This is an important factor in metal forming process since brittle metals are more likely to rupture. A tensile test is commonly used to select a material for an application, for quality control, and to predict how a material will react under different types of forces. WMT&R provides several types of tensile testing performed under standardized or customized specifications. Tensile Tests can be performed at room temperature, elevated temperatures (-452 to 2200°F), with a variety of specimen types, fixtures and customizable test setups. The Tensile Testing laboratory at WMT&R can provide standardized and customizable tests for a variety of industry applications and materials including metals, alloys, composites, polymers, ceramics, plastics, wood and more. 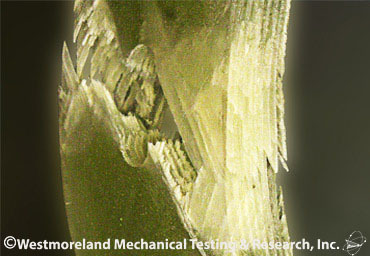 Ultimate Tensile Strength is determined by dividing the highest load experienced by the specimen before rupture by the original cross section of the test specimen. Yield Strength is determined by the amount of stress that is required to begin plastic deformation of the test specimen. The Elastic Modulus or Young's Modulus is determined by the ratio of stress to strain below the elastic limit. The Modulus of Elasticity measures the stiffness of a material but it only applies to the portion of the test where the ratio of stress to strain is constant. On an x/y axis graph of the Tensile Test this portion of the test would be represented by the straight line portion of the graph prior to the beginning of the curve. At this point in the test, if the load were to be removed, the test specimen would return to its original condition. After this point in the test, plastic deformation begins to occur, and the test specimen will not return to its original proportions upon relaxation of the load. The Offset Method for determining Yield Strength is used when the material being tested does not show an easily identifiable departure point from the linear elastic region on the graph. Many metals and most plastics fall into this category. An offset is specified as a % of strain. A line is drawn from the offset with the same slope as the Modulus of Elasticity. The stress value at the intersection of the offset line with the line of the linear elastic region is then used for the Yield Strength by Offset Method. Modulus of Toughness is determined in the Tensile Test by calculating the total area under the stress/strain curve to the point of failure. Modulus of Resilience is the energy that can be absorbed per unit volume without causing permanent distortion. And may be calculated by integrating the stress/strain curve from zero to the elastic limit and then dividing by the original volume. Fracture Stress is the load at fracture divided by the cross sectional area at fracture. Engineering Stress and Strain is the ratio of the applied load to the undeformed cross-sectional area, while, True Stress and Strain is the ratio of the applied force to the instantaneous cross-sectional area. True Stress and Strain calculates for the reduced area of the test specimen as plastic deformation occurs. For most applications involving small strain rates (less than 5%) Engineering Stress and Strain are accurate enough. For larger strain rates, the more involved calculations to arrive at True Stress and Strain become necessary. Tension tests provide information on the strength and ductility of materials under uniaxial tensile stresses. This information may be useful in comparisons of materials, alloy development, quality control, and design under certain circumstances. The results of tension tests of specimens machined to standardized dimensions from selected portions of a part or material may not totally represent the strength and ductility properties of the entire end product or its in-service behavior in different environments. These test methods are considered satisfactory for acceptance testing of commercial shipments. The test methods have been used extensively in the trade for this purpose. For complete information on ASTM E8, go to astm.org. Determination of modulus of elasticity and proportional limit are not included. Tension tests under conditions of rapid heating or rapid strain rates are not included. 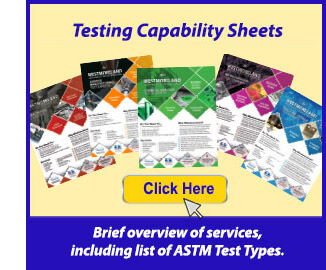 The primary use of these test methods is testing to determine the specified mechanical properties of steel, stainless steel and related alloy products for the evaluation of conformance of such products to a material specification under the jurisdiction of ASTM Committee and its subcommittees as designated by a purchaser in a purchase order or contract. These test methods may be and are used by other ASTM Committees and other standards writing bodies for the purpose of conformance testing. The material condition at the time of testing, sampling frequency, specimen location and orientation, reporting requirements, and other test parameters are contained in the pertinent material specification or in a General Requirement Specification for the particular product form. 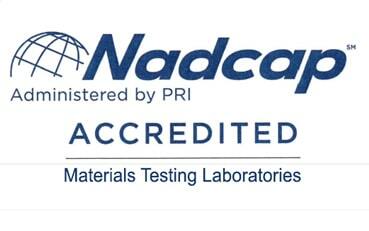 Some material specifications require the use of additional test methods not described herein; in such cases, the required test method is described in that material specification or by reference to another appropriate test method standard. These test methods are also suitable to be used for testing of steel, stainless steel and related alloy materials for other purposes, such as incoming material acceptance testing by the purchaser or evaluation of components after service exposure. This test method is applicable for testing materials of any thickness up to 14 mm (0.55 in.). However, for testing specimens in the form of thin sheeting, including film less than 1.0 mm (0.04 in.) in thickness, ASTM standard D882 is the preferred test method. Materials with a thickness greater than 14 mm (0.55 in.) shall be reduced by machining. This test method includes the option of determining Poisson's ratio at room temperature. This test method is designed to produce tensile property data for the control and specification of plastic materials. These data are also useful for qualitative characterization and for research and development. Some material specifications that require the use of this test method, but with some procedural modifications that take precedence when adhering to the specification. Therefore, it is advisable to refer to that material specification before using this test method. Tensile properties are known to vary with specimen preparation and with speed and environment of testing. Consequently, where precise comparative results are desired, these factors must be carefully controlled. It is realized that a material cannot be tested without also testing the method of preparation of that material. Hence, when comparative tests of materials per se are desired, exercise great care to ensure that all samples are prepared in exactly the same way, unless the test is to include the effects of sample preparation. Similarly, for referee purposes or comparisons within any given series of specimens, care shall be taken to secure the maximum degree of uniformity in details of preparation, treatment, and handling. The values stated in either SI units or inch-pound units are to be regarded separately as standard. Within the text, the inch-pound units are shown in brackets. The values stated in each system are not exact equivalents; therefore, each system must be used independently of the other. Combining values from the two systems may result in nonconformance with the standard. A thin flat strip of material having a constant rectangular cross section is mounted in the grips of a mechanical testing machine and monotonically loaded in tension while recording the force. The ultimate strength of the material can be determined from the maximum force carried before failure. If the coupon strain is monitored with strain or displacement transducers then the stress-strain response of the material can be determined, from which the ultimate tensile strain, tensile modulus of elasticity, Poisson's ratio, and transition strain can be derived. What is the purpose of the Tensile Test? Tensile testing, also known as tension testing, is a fundamental materials science and engineering test in which a sample is subjected to a controlled tension until failure. Why is the tensile test done? These types of tests may be performed under ambient or controlled (heating or cooling) conditions to determine the tensile properties of a material. Tensile testing is commonly used to determine the maximum load (tensile strength) that a material or a product can withstand. Why tensile strength is important? The tensile strength of a metal is essentially its ability to withstand tensile loads without failure. Ductility, on the other hand, measures a material's ability to deform under tensile stresses. This is an important factor in metal forming processes since brittle metals are more likely to rupture. Why is tensile testing of plastics important? What is the tensile modulus of a polymer? Tensile Modulus of Elasticity. The tensile modulus is the ratio of stress to elastic strain in tension. A high tensile modulus means that the material is rigid - more stress is required to produce a given amount of strain. In polymers, the tensile modulus and compressive modulus can be close or may vary widely.